I love eggplant, but I do realize that eggplant is one of those vegetables that people either love or hate. 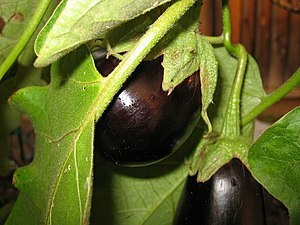 If picked too late, eggplant can be fibrous and bitter and let’s face it, no one likes that. One of the joys of fresh, local eggplant is that it is so far superior of grocery store eggplant, that it can make a convert out of a hater. I managed to sway Tom’s opinion with this recipe, but Ellie is still out. Our eggplants are in season now and so delicious! This recipe makes the most of fresh, local eggplant, tomato and basil. We have local mozzarella thanks to Hillsborough Cheese Company, so only the Parmesan Reggiano. olive oil and salt were store-bought. We used some of our yummy Roasted Tomato Sauce, which is my favorite discovery of this summer (well, maybe it’s a tie with Mae Farm Bacon Onion Marmalade). Think of this recipe as lasagna with eggplant replacing the noodles. This is no greasy, fried, chain restaurant dish and Tom and I commented several times that it was hard to believe this was a meatless dish. Healthy and delicious. Win-win. Yum-yum! Wash eggplant and slice into 1/4″ or so slices. Put slices on the backing sheet and brush with olive oil. Sprinkle lightly with salt. Roast eggplant slices for about 12 minutes–until they are fork tender. Spread a thin layer of tomato sauce on the bottom of a 9 x 13 baking dish. Add one layer of the eggplant. Top with 1/3 of the tomato sauce, a sprinkling of basil leaves, 1/3 of the mozzarella and 1/3 of the Parmesan. Repeat layers two more times, ending with cheese on top. Bake in oven for about 40 minutes, until hot and bubbly and golden brown on top. Let sit for 5 minutes before serving.